Preheat oven to 350 degrees. 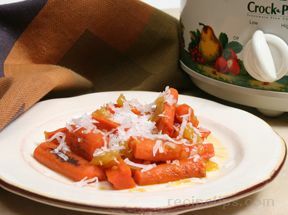 In a large pot of lightly salted water, cook carrots until crisp tender, drain and set aside. In a large saucepan over medium heat, sauté chopped onion in 3 tablespoons butter, cooking until tender. Stir in flour, salt and pepper. Gradually add milk and bring mixture to a boil, stirring constantly. Cook for 1 minute or until thickened. Add cubed cheese and stir until cheese is just melted. 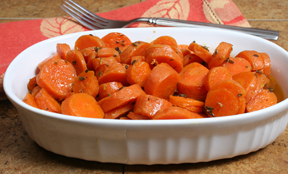 Add cooked carrots and chopped parsley. Mix well and pour mixture into a greased 8" square baking dish. In a medium microwave-safe bowl, place butter. Heat in microwave until butter has melted. Add cornflakes and toss until coated. 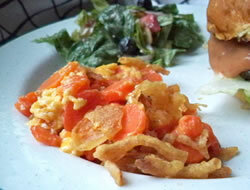 Sprinkle cornflakes over ingredients in baking dish. Bake in oven for 20 to 25 minutes or until bubbly. Makes 6 servings.